WILKES-BARRE, PA – USAgain is in the business of making a difference for people and planet, which we do by diverting clothing from landfills and reusing/recycling it instead. In July 2012, one USAgain driver made a positive difference in a much different way. Jimmy Aton, a driver at USAgain’s Pennsylvania division, averted a highway catastrophe last summer in Lower Macungie Township, PA. While out driving around, Aton spotted a tanker truck rolling through traffic at about 4 mph. Outside the truck was a man banging on the door of the truck in an attempt to awaken the driver, who was unresponsive. As he realized the truck was headed into heavy traffic, Aton climbed out of his truck and ran toward the tanker, where he hopped into the cab and safely brought the vehicle to a stop. The driver of the tanker had died at the wheel; without Aton’s swift response to the runaway truck, more lives could have been in jeopardy. USAgain applauds Jimmy Aton’s actions to avert a highway crisis and appreciates his service as a driver service representative. 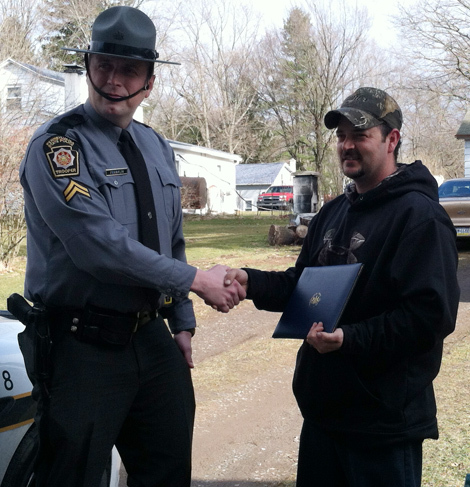 Pictured below is the certificate awarded to Aton by the Pennsylvania State Police Department.